Yulya Levyuk was born in the Ukraine. She begun her musical education in 2006 in Professor Natalya Yuziuk class of piano and in Professor Bogdan Bazylukut class of singing. In 2011 she completed with distinction studies in Ivan Franko National University in Lvov in the class of piano and in the class of singing. She was granted the title of master of arts and lecturer of piano. After her studies she perfected her musical skills in numerous musical courses and workshops led by such distinguished artists and pedagogues as Olga Pasiecznik, Ewa Komorowska, Margarida Llodo and Makwala Kasrashvili in Spain, Ukraine, Poland, Russia and Austria. Currently, Ms. Yulya Levyuk is perfecting her musical artistry under the care of Professor Olga Pasiecznik and Professor Claudia Visca at the Institut für Gesang und Musiktheater in Vienna, Austria. 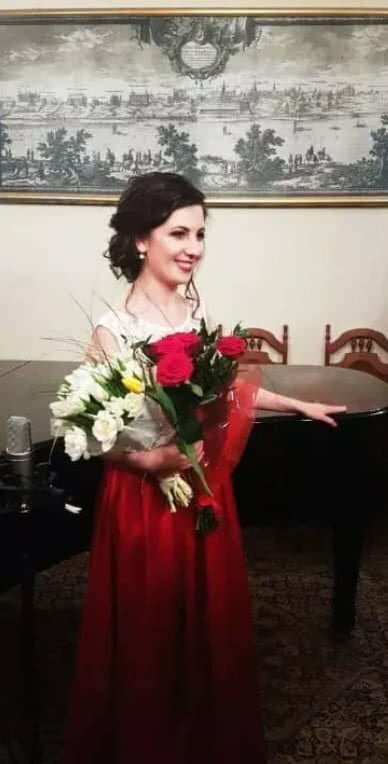 “Yulya Levyuk during her two-year activity in my Author’s Unisono Musical Academy in Warsaw proved to be highly profiled professional piano teacher. She has very good contact with the pupils of her class of piano and shows a lot of initiative and engagement in her job. She treats every student as an individual person and tries to find out and strengthen his specific abilities. She pays special attention to correct student’s piano technique as the basis for the most important part of musical education, i.e. for the development of musical expression. Ms. Levyuk second passion is opera singing which she continually perfects.